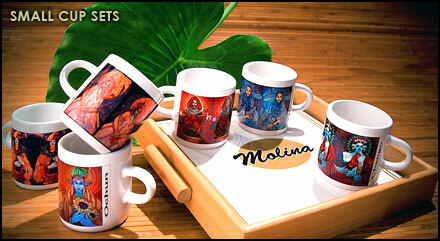 Luis Molinas artwork extends to other categories that make for excellent gifts: tiles, coffee sets, jewelry boxes, pendants, etc. 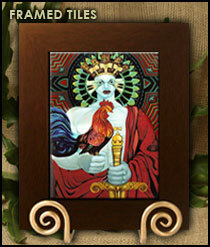 The framed tiles are framed in your choice of dark brown or black wood. They are ready for hanging on the wall or as a stand-up piece of art. The golden curly metal piece to hold the frame upright is not included, but it is available to purchase. The overall size, including wood frame is 10. 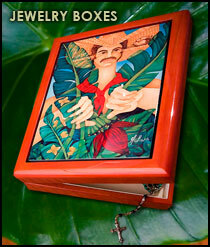 Our jewelry boxes make for an exquisite gift item. Make an impression with these beautiful novelty items.